The Oort Cloud is part of the Solar System – at roughly 1000 times the distance to the edge of the heliosphere. Voyager may be entering the interstellar medium, but it’s still well within the solar system as defined by the Sun’s gravitational influence. But that neighborhood is just defined by the proximity of our nearest neighbors. If more stars were closer, they would strip away the comets. Anyway, Voyager is observing winds and fields, not solid objects, so the appropriate contextual definition is being used. But from your point of view a satellite that has travelled just outside the atmosphere has left Earth. This solar boundary is nothing more than the Sun’s atmosphere. Yes… that’s the common definition of the “edge of space.” But the Earth’s magnetosphere might be a more apt analogy. 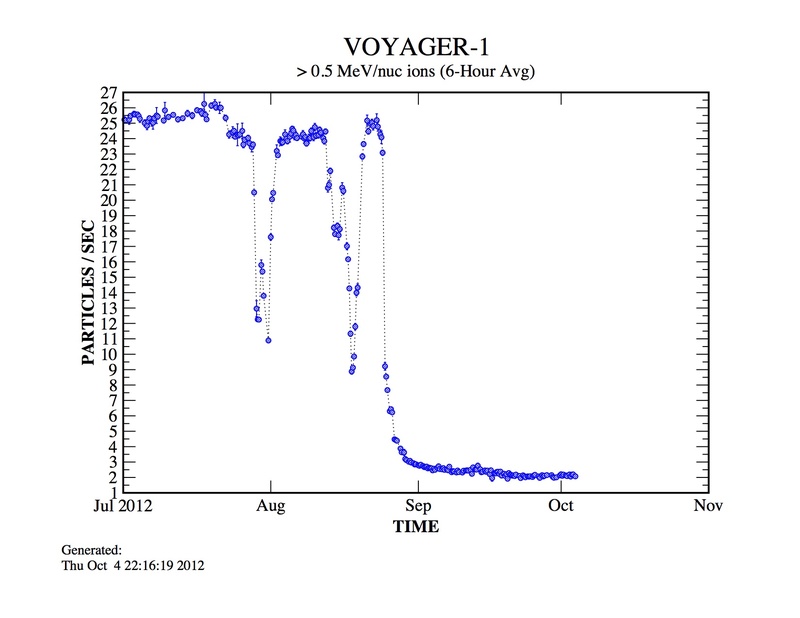 The point isn’t getting to somewhere else, because we know Voyager isn’t going to another star. The point is learning something about the space between stars. How much protection does the Sun’s environment give us? Likewise we know about interplanetary space, which for us starts outside Earth’s magnetosphere. Unfortunately, Voyagers will never be able to leave the Solar System…At least, in the our lifetimes… It may be better to spend energy to define the “boundary of a Solar System”, first ! Otherwise, just spending time and energy ! Ok stupid question time here, I’m assuming that objects like Comets that have a large orbit in the hundreds or thousands of years are probably travelling faster than Voyager and yet they eventually come back. What’s stopping Voyager (as well as V2, P1 and P2) from losing momentum and coming back in a few hundred or maybe a thousand years? Even the sun has a scape velocity, which means that if you travel fast enough, you’ll fly free forever and leave the influence of our sun one day. Those comets may be very fast once they reach the inner system, but their velocity in the apogee is very very slow. I’m going to assume if the solar system were surrounded by a film like a soap bubble (and I’m not saying it is), but the force of Voyager 1 hitting even a tenuous membrane at its velocity like that would render it inoperable. Whether it’s in or out, it is where it is. My question is ………what are the future plans for Voyager 1? Voyager’s signals are incredibly faint, yet can still be picked up by the Deep Space Network’s radio antenna in Goldstone, California. Takes about 17 hours for a transmitted signal to reach us!